Be sure to visit your closest SOULed OUT outlet for a taste of tradition, where everyone is invited to celebrate the auspicious and prosperous Year of the Dog. The popular neighbourhood haunt will be pulling out all the stops to commemorate Chinese New Year across all its outlets with traditionally themed food and beverage promotions until 28th February 2018. During this period, families will get the chance to ‘Loh Sang’ with friends and enjoy varied ‘Yee Sang’ deals starting as low as RM23 per portion. Not forgetting the SOULed OUT brand’s own tradition of serving up hearty portions of delicious food that bring people back for more, the Chinese New Year Snack Plate will be available for RM18 and includes season favourites like chicken ‘siew mai’, ‘wantans’ and ‘money bags’, as well as steamed prawn dumplings and fried ‘mantau’. In a modern twist that nonetheless pays homage to the festival’s origins, the Chinese New Year cocktail of the month, the Mandarin Orange Mojito, is also now available at RM21. Another symbol of the strong ties between family and friends, thematic of the season, is of course the observance of Chap Goh Mei, which marks the end of the Chinese New Year festival. 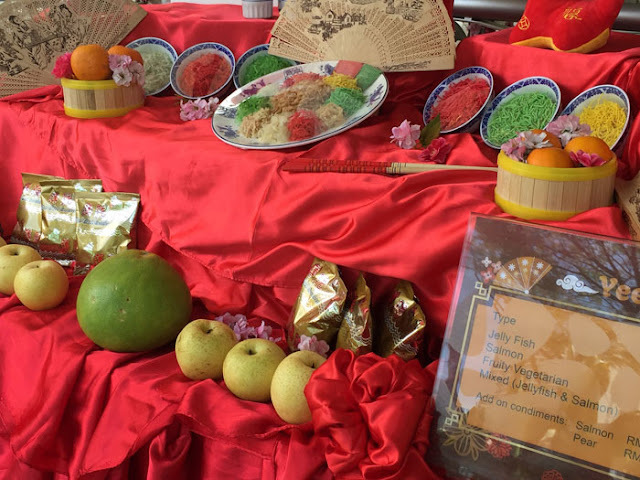 While this tradition has evolved over recent years, the spirit of openness, generosity and abundance persists in cultural observances such as the seasonal decorations, ‘tang yuen’ or glutinous rice balls served in syrup to polish off multi-course Chap Goh Mei dinners and of course, the gifting of mandarin oranges. To celebrate the formation and renewal of ties, SOULed OUT will host Chap Goh Mei in a spectacular fashion and everyone is welcome to share in the tradition and togetherness. 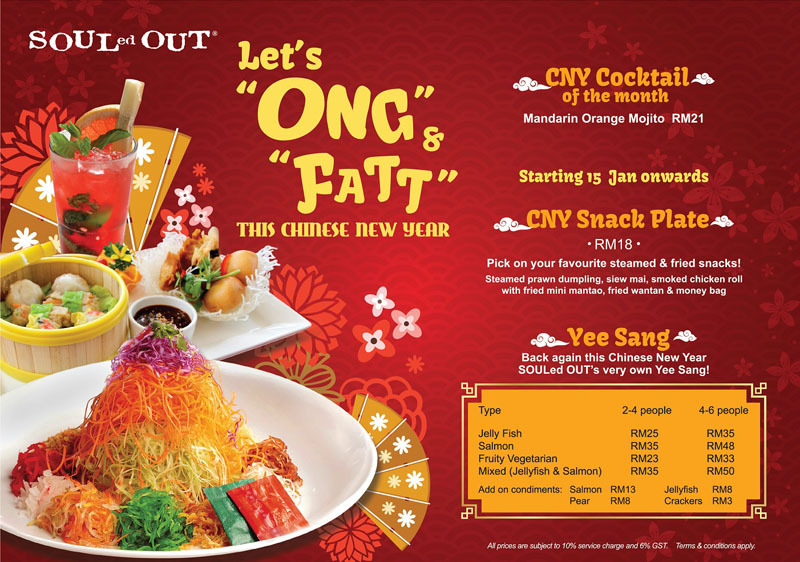 All SOULed OUT outlets will shout CNY ambiance as firecrackers herald a special visit by ‘Choi Sun’, the God of Prosperity and his lucky lions. By taking part in giant ‘Loh Sang’ ceremonies, as firecrackers are lit to ward off bad luck, guests can attempt to improve their fortunes in the coming lunar year by touching the robes of the God of Prosperity or by petitioning lion dancers for oranges as they go around bringing ‘Ong’ (luck) and ‘Fatt’ (prosperity) to all 5 SOULed OUT outlets. In addition to a face changing act, visits from lion dancers and the God of Prosperity, the most recent addition to the SOULed OUT family will be getting a very special live performance by the popular band EvenFlow. Guests at SOULed OUT Ampang will be entertained by the SO Gaya dancers and a face changing performance as they celebrate Chap Goh Mei. Guests will enjoy an instrumental performance of Chinese music, a face changing act, ‘Kung Fu’ and dance performances in addition to the Chap Goh Mei festivities taking place across all SOULed OUT outlets. The Bangsar South outlet will be celebrating Chap Goh Mei with ‘Choi Sun’ and ‘Kung Fu’ performances as well as Chinese instrumental music. As with other outlets, SOULed OUT Kota Kinabalu will be hosting a giant Loh Sang ceremony with visits by lion dancers and the God of Prosperity to the accompaniment of firecrackers and instrumental Chinese music.